Looking for a dental clinic to call home? Riverbend Family Dental Care in Edmonton is always welcoming new patients. At Riverbend Family Dental Care, we aim to provide you with quality dental treatment in an environment you can feel comfortable in. Our spa-inspired office is conveniently located off the highway and offers complimentary parking. We also think you’ll appreciate our evening and weekend availability, as well as the dental services and care we provide! 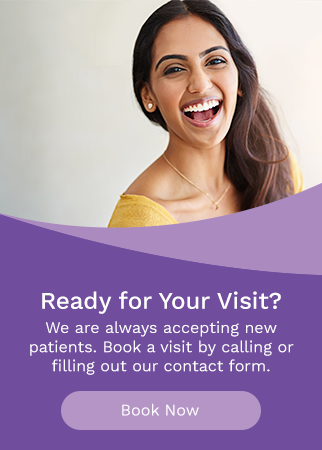 When you come in for your first visit, we will ask you to fill out a New Patient Form and a Medical Form. We will complete a full oral exam in order to help determine your dental needs and review your past medical and dental history. Does your office accept new patients? Yes! We welcome anyone who is interested in coming to our office and appreciate any referrals from existing patients to family and friends. How do I make an appointment with your office? You can come in and schedule an appointment in person, call our office, or book through our form online. If you book online, our admin team will follow up to confirm your appointment. We strive to make appointment bookings as simple as possible for you! What is your cancellation or re-scheduling policy? Our policy is that we need at least 48 hours of notice if a patient is unable to attend an appointment. An appointment is generally reserved for about an hour. With sufficient notice, our office has time to contact another patient who may have wanted to come in during that time frame. Do you deal with my dental insurance? Yes, our office is happy to deal directly with your dental insurance as long as they allow assignment of benefits. Does it really matter is I lose a tooth? Every tooth in your mouth plays an important role in speaking, chewing and in maintaining proper alignment of your other teeth. Tooth loss isn't restricted to kids and seniors, so if you do lose a tooth, the gap must be filled by a dental implant, bridge or removable denture in order for your mouth to function properly. At what age should a child get his/her first dental check-up? The rule of thumb, "first check-up by first birthday," is recommended by the Canadian Academy of Pediatric Dentistry. Contact our clinic for more information on baby bottle tooth decay and taking care of your baby's gums even before primary teeth erupt. A child can visit the dentist as early as the eruption of his or her first tooth, and the child should definitely be scheduled for an examination by the age of 2 or 3, or when the child’s baby teeth have all come in. This visit is important because it helps us ensure that brushing at home is being done properly. It also allows us to treat or prevent any oral health complications that the child may have. When preparing your child for a dental visit, avoid using phrases like "it won't hurt" or "don't be scared," as this may cause your child to feel nervous or afraid. Our hygienists can help you obtain and maintain a healthy mouth through regular cleanings and may detect a specific reason for bad breath. Why bother getting a filling in a baby tooth? Fillings in decayed primary (baby) teeth are recommended because some primary teeth can remain in your child's mouth until the age of 12. If the decay worsens or the tooth gets infected, the tooth may need to be pulled. The new space created can cause the permanent teeth to crowd when they erupt. If the child does lose a tooth to decay, the dentist may recommend a space maintainer to prevent crowding, or perhaps braces in the future. Therefore, filling decayed primary teeth is often the healthier choice for the child and may save the parent treatment costs in the long run. Ready to book a visit with our dental team? Contact us today! We look forward to working with you.